Bonham, John L., firm of Matthews & Bonham. Bulger, James M., coffee house. Crowley, Nicholas, grocer, Market Square. Fannce, J. L., from Smithfield, Ohio. Fry, John L., Jr., son of the Hon. J. L. Fry. Gardner, Thomas J., lumber merchant, North Wheeling. Hughes, Dr. Alfred, brother of Thomas Hughes. Hughes, Thomas, tailor, clothing house. Hunter, John, formerly of Steubenville, Ohio. Ibertson, Robert, grocer, corner Market and Union Streets. Kelly, Aaron, nail factory, Benwood. Keyes, Aber, clerk, with Thomas Hughes. Knote, John, saddler, Main Street. Letcher, Peter, Catholic book seller, Washington Hall. McCoy, William, cashier at the Savings Institute. McNash, J. H., formerly of Bosley & McNash. Miller, W. B., foundry, near the Wheeling Creek Bridge. Miller, William, foundry, near the Wheeling Creek Bridge. Moore, Henry, from Washington, Pennsylvania. Moore, Philip W., editor of the Wheeling Union, Whig newspaper. Orr, John W., shoemaker, from Washington, Pennsylvania. Otterson, William, railroad stone mason.Over, Rodolph. Pannel, A. J., lumber merchant, near the Custom House. Phillips, Hans W., machinist and foundry, North Wheeling. Phillips, William C. Pool, Jerome, coffee house, Washington Hall. Purcell, William. Riley, J. B., clerk, with Michael Riley. Riley, Michael, groceries and liquors, Market and Monroe Streets. Riley, Philip, (Michael Riley’s son). Riley, Thomas M., (Michael Riley’s son). Sanger, Ira, a New Yorker. Seabright, Charles W., clerk with Thomas Hughes. Stransberg, Job, sexton, East Wheeling graveyard. Stransberg, R. A., (Job Stransberg’s son). Sweeney, James, Sr., brick maker. Towers, John H., clerk with Thomas Hughes. Wheeler, George, clerk under John McColloch, of the County Court. White, Andrew, clerk, North Western Bank. Wilson, William P., boat builder, firm of Wilson & Dunlevy. Zane, Daniel, of Wheeling Island. Zane, Eugene, son of Ebenezer Zane, deceased. Following the Civil War, one was required to take an Oath of Allegiance. And, swear to support, protect and defend the Constitution and Government of the United States and the same applied to any state government. I, ___________________, do solemnly swear that I will support, protect, and defend the Constitution and Government of the United States against all enemies, whether domestic or foreign; and that I will bear true faith, allegiance, and loyalty to the same, any ordinance, resolution, or law of any State Convention or Legislature to the contrary notwithstanding; and further, that I do this with a full determination, pledge, and purpose, without any mental reservation or evasion whatsoever; and further, that I will well and faithfully perform all the duties which may be required of me by law: So help me God. this _____ day of _____________, 1867. 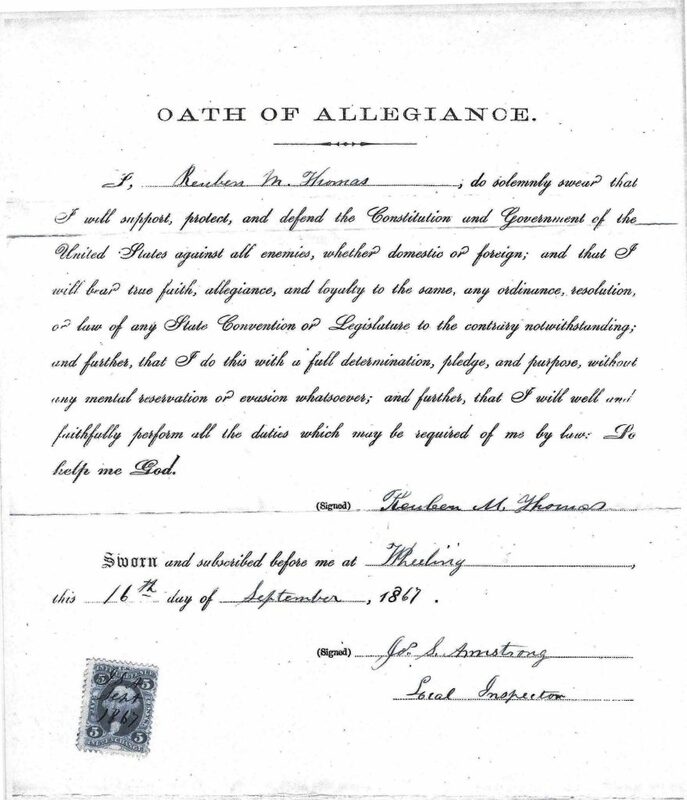 Reuben M. Thomas, a Wheeling steamboat engineer, who would later become a steamboat inspector of hulls, working out of the Wheeling Custom House (Office 2nd floor NW corner, West Virginia Independence Hall) signed this oath.